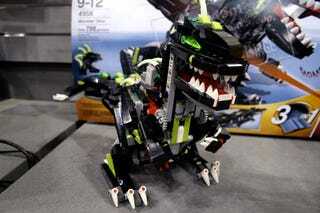 The dinosaur walks, moves its head and roars using a remote control. It can also be made into a walking spider and a crawling crocodile. It will retail for $89.99 when it comes out in August. The Ferris Wheel must be over two feet high. It's fully functional, and can be turned into a crane or working drawbridge (which both sound more interesting to me). This will sell for $69.99, and is also available in August.